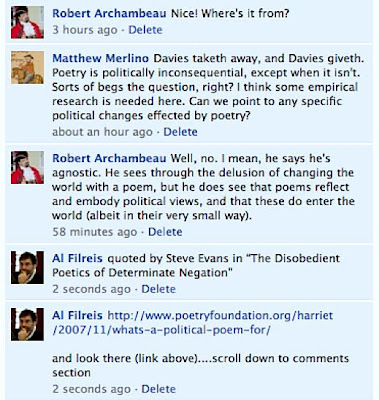 Al Filreis: can a poem be political? I'm reminded of Ed Dorn saying something like 'You're handing me this piece of paper and telling me it's political? It's about as political as a gopher hole.' I'm totally agnostic about the ability of unpopular verse to affect change in the political world. I just don't believe it. I don't think for a second, oh, here I am striking a blow against capital. Political change is not made by the choices that we're making in verse. We're doing this so that certain possibilities can exist in the world. So that works of art can exist, temporarily, and they'll certainly bear traces of our political vision because if they don't they're no good.